Representative Honours: Northern Ireland: 1 Under-23 Cap (1989), Under-16. Northern Ireland Youth and Under-23 international Tony Diamond began his Football League career as a YTS player with Blackburn Rovers, making his debut in a 6-1 thrashing of Sunderland in September 1986. Diamond had to wait until January to find the back of the net, in his fourth start, against Oldham in a 1-0 win. He scored again a week later against Shrewsbury, but they were to be his only goals that season. In April 1989 Diamond won an Under-23 cap in a 3-0 defeat by the Republic of Ireland, coming on as a late substitute for Michael Hughes. By this stage though he had already dropped out of the first-team reckoning at Ewood Park, starting just three games, scoring once, over the previous two seasons, and had had an impressive loan spell at Wigan Athletic in October 1988. He endeared himself to the Latics faithful on his debut, a 2-1 win over Southend, when he returned to the field of play following a facial injury. Four days later he scored on his home debut, in a 2-2 draw with Preston. Early in the 1989/90 season Diamond was signed by Blackpool, where he was later to earn the dubious title of "Worst Ever Blackpool FC Player". It is hard to fathom how a player who played just three games, and actually scored, could have earned this acolade, but it was a difficult time for the Seasiders which saw them relegated to the bottom division. 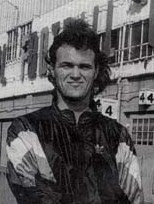 After his release by Blackpool in 1990, Diamond moved into non-league football.